According to the US National Association of Homebuilders, 82% of construction companies consider their main concern to be a shortage of construction workers. Sure enough, figures show that the average age of the workforce is rising faster than ever: the UK Chartered Institute of Building reports that the number of workers over 60 is increasing faster, and the set under 30 decreasing faster, than any other set. Enlisting and managing talent has long been a challenge for the construction sector. As Brendan Bechtel, chairman and CEO of Bechtel Group, says: “Ours is a people business that depends on fielding the most capable project teams in the world.” It’s a challenge that’s only going to be more pressing in the years ahead – and not solely in construction. A recent World Economic Forum report warns how troublesome coming employment trends might prove: the continuing volatility of workforce demand and composition; the scarcity of skilled labour, driven by demographic shifts; and the demand for new and broader skill sets at all levels, driven by surging technology. In a recent construction-industry survey conducted for the World Economic Forum, with more than 100 respondents, 77% of respondents agreed that the industry is not doing enough to attract and retain talent, and not one of the respondents fully agreed that the industry is investing enough in recruitment. Traditionally, workforce management in construction was equivalent to living a boom-to-bust cycle: hiring and firing followed the general trend of the economy. Winning the war for talent, however, requires a fundamentally longer-term approach. The first step involves strategic workforce planning: i.e. thinking strategically about the company’s future demand in terms of quantity and quality of skills, and the likely availability of those skills, to systematically plan recruitment, retention and training. One quick look at the demographics of the construction industry, and you can see how important planning is: the average age of construction workers in the US is 43; in the UK, 700,000 additional construction workers are needed over the next five years to meet the government’s objective of 1 million homes, according to the Farmer report. The concerns are not just about the future quantity, but also the quality of the skilled workforce. The construction industry is undergoing a rapid digital transformation – through disruptive technologies such as Building Information Modelling (BIM), wireless sensing, big data and analytics, 3D printing, and autonomous equipment – that requires radically different skill sets; this puts the industry in competition with tech companies such as Google or Apple for data scientists and IT experts. 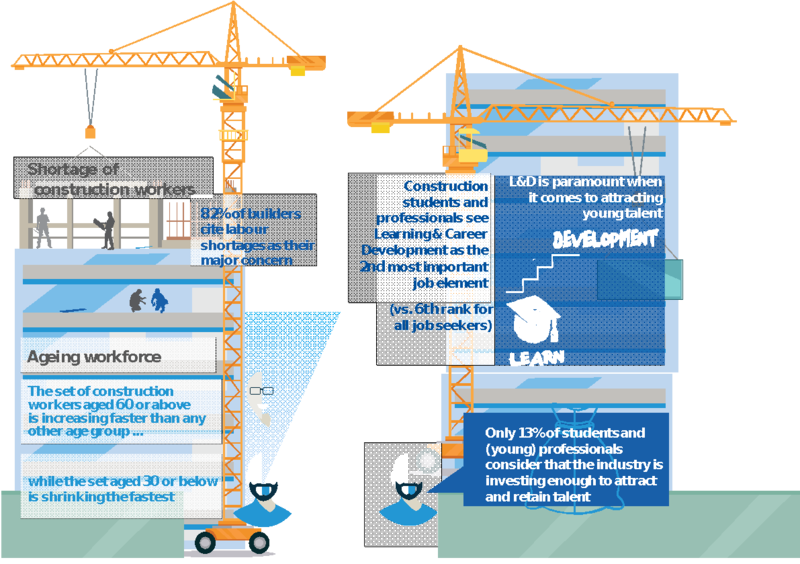 For construction CEOs, people and talent management has to become a top priority, because for students and young professionals it is already a key factor in their choice of employer. When Elon Musk, exasperated by the traffic in Los Angeles, tweeted his intention to develop a tunnel-boring machine and create underground roadways, many people would have dismissed it as yet another crazy idea coming out of Silicon Valley. Some construction-industry participants, though, including the German tunnel-boring specialist Herrenknecht, took it far more seriously. By setting out a bold vision and creating a culture that is undaunted by tradition, Musk and other successful innovators manage to attract the best talent from very different fields and to defy standard industry practice. In contrast, many or most construction companies are characterized by a conservative, “fear of failure” corporate culture and hampered by organizational inertia. Culture is a talent magnet, and construction companies need to implement a corporate culture that challenges the status quo and embraces innovation wholeheartedly. One example: some firms have started to break down the traditional hierarchies by means of “reverse mentoring”, i.e. assigning young employees the task of mentoring established executives. “Pale, male, stale” may belong to yesterday, as a previous blog pointed out, but that kind of workforce persists widely in the construction industry: male employees with an engineering background still predominate, despite the demographic changes and the industry’s digital transformation. Construction companies really need to tap into non-traditional pools – community specialists, women, those with backgrounds in tech or IT or data science. A recent study by the Boston Consulting Group found a clear link between workforce diversity and innovation – mixed teams with diverse industry backgrounds and career paths tend to make a particularly powerful impact. As the construction industry continues its tech-driven transformation, it increasingly needs different and more flexible skill sets, and companies need to hire on the basis not just of existing skills but also of potential. By embracing innovation and new technologies, construction companies can not only make themselves future-ready, but can also meet the talent challenge. Increased automation, off-site prefabrication, new collaboration tools – such advances will help to enhance productivity (and wages) as well as reduce the time spent on site (two key wishes for the respondents in our survey). Some innovations that are now standard in the automotive industry – exo-skeletons, human-robot collaboration, and ergonomic work processes – could benefit construction work too, making it less physically demanding and better suited to an ageing workforce. Our survey revealed that for students and young professionals, one of the most appealing aspects of a potential job (second only to interesting job content) is learning and career development (L&D). Yet only 48% of respondents found that the construction industry fulfils their expectations in that regard. Continuous L&D is particularly important in a radically changing industry environment that requires different skills. Construction companies should be integrating continuous L&D into their culture, whether through internal academies, partnerships with external training institutions, or both. No commentary on the subject of talent would be complete without some reference to the different priorities of Generations Y and Z. Today’s young talents look beyond salary packages and benefits, and emphasize flexibility (“own your time”), purpose and ethics. Many companies in the tech sector and others have already adapted their recruitment and retention schemes to reflect those new priorities; construction companies need to up their game if they are to compete in the quest for talent. A millennial might well be attracted by the opportunity to help transform a millennia-old industry – but only if he or she feels that the company is genuinely embracing the change. Construction still has a “dull and dirty” image currently, but companies are well positioned to create a more appealing image – one of a dynamic and purpose-driven industry. In our survey, industry professionals proudly cited their beneficial impact on society (“we build things”), their contribution to national development, and their engagement with some of the serious modern challenges such as urbanization and climate change. And it’s true, construction accounts for 6% of global GDP, creates the physical milieu for all other industries to flourish and directly affects everybody’s quality of life through social infrastructure such as housing, hospitals, transport systems, schools and theaters. What’s more, built structures and engineering achievements – whether the Egyptian pyramids, the Roman Colosseum, the Panama Canal, or skyscrapers like the Burj Khalifa – have always fascinated people, and continue to do so. Construction stakeholders should collaborate more in communicating this impact, and should relay their fascinating stories more broadly by means of social media. Companies should start early, and go out to schools and universities to actively shape the image of the industry. The seven actions listed so far may take some time to implement and will certainly take some time to succeed. They require a shift in paradigm, spanning the entire construction ecosystem. One crucial facilitator will be collaboration between companies – to leverage synergies and coordinate campaigns. Collaboration with external organizations is likewise crucial – with universities, for instance, in providing continuous L&D of construction professionals and in tailoring curricula to the future needs of the industry. One striking example, leveraging the new format of Massive Open Online Courses (MOOCs), is Columbia University’s Construction Project Management and Planning Specialization, which brings together 20 industry leaders from different companies.